The island of SKOPELOS is the biggest of the Sporades or the Sporadic group of islands. Skopelos offers 3 main holiday ingredients that make it a must Greek island to visit. Skopelos is relatively untouched by mainstream tourism, it offers some of the most amazing scenery with its lush and mountainous interior covered with pinewoods, its rocky and sandy coves with the tree line reaching right up to the sea giving the water its emerald green look, and Skopelos has some of the best beaches in Greece with crystal clear waters. The main port and municipal center of the island also named Skopelos or Chora is noted for it traditional architecture. Here you will find a variety of hotels and apartments to book and stay for your vacation. In Skopelos town you will also find a variety of shops, bars and tavernas. The second largest settlement in Skopelos is Glossa village situated on the north western part of the island, just above Loutraki harbour. 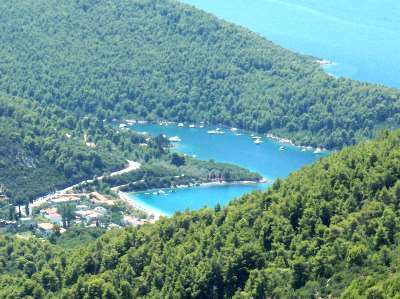 Other villages include Neo Klima, Panormos, Staphylos, Agnondas, Klima, Ananias, Atheato, Loutraki, Mili and Kalogeros. 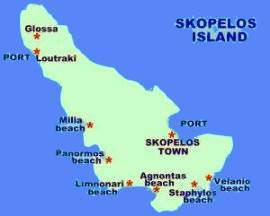 Skopelos island has two ports: Glossa and Skopelos town. 5. From Thessaloniki : By hydrofoil to the port of Skopelos town approximately 4 hours journey.